You wear your clothes every day and probably take great pains to keep a number of different outfits ready for any occasion. You’ve likely invested time and effort into making sure your clothes fit properly and look good when you put them on. It’s kind of odd then, that most of us pay little attention to what we clean our clothes with. There are commercial laundry soaps galore on store shelves and each assures that it does the best job when it comes to getting clothes clean. But these soaps are also full of chemicals. The average laundry soap has a number of harmful substances in it that could potentially enter into your skin when you wear clothes that retain some of these chemicals. As for the air you breathe, some estimates peg the number of volatile organic compounds (VOCs) that can be released into the air when using commercial laundry soaps or dryer sheets in excess of 25. There is a way you can reduce your exposure to the chemicals in laundry soap and that is to try to buy products made without these harmful chemicals. Alternately, you can use some all-natural, time-honored soap recipes that you can make yourself right in the comfort of your own home. When buying laundry soap from the grocery store, you can be sure that a product labeled with a dozen warnings is probably not going to be good for your skin or the environment. Instead, look for products with the fewest toxicity warnings. Buy products scented with natural essential oils instead of artificial fragrance. Avoid using chlorine bleach to whiten clothes. Instead, try borax. Borax is made from sodium borate, a mineral that occurs naturally in the environment. Sodium borate contains sodium, boron, oxygen and water. You can add a 1/2 cup of borax to regular detergent to help remove stains and brighten whites and colors. Use borax in small amounts as it too can be harmful in large amounts. Try adding white vinegar to your rinse cycle. White vinegar is great for fighting odors and preventing mold and mildew. White vinegar also brightens clothes and can be used as a fabric softener. NOTE: Don’t combine vinegar with bleach as it creates a toxic chlorine vapor. Here’s a homemade recipe you can create from scratch. Add 11 cups of washing soda to 15 cups of baking soda. Mix in seven cups of castile soap and three tablespoons of essential oil (such as lavender or lemon). This recipe should get you through months of doing laundry. Here’s one more laundry trick. Avoid taking your clothes to the dry cleaners after a single use. Fill a spray bottle with inexpensive vodka and spot spray clothing (check for color fastness first). Alcohol kills the bacteria that can lead to odors. There you have it: all the information you need to create a healthier and more-environmentally friendly laundry soap. Your clothes will appreciate it and your body will too. As for the environment, you may not be able to see the impact firsthand, but you will be contributing to less pollution in the air and water. Hollender, J., et al., “Natural, Homemade Laundry Soaps, Mother Earth News web site, July 14, 2011; http://www.motherearthnews.com/natural-health/natural-laundry-soap-ze0z11zhir.aspx, last accessed Dec. 10, 2013. 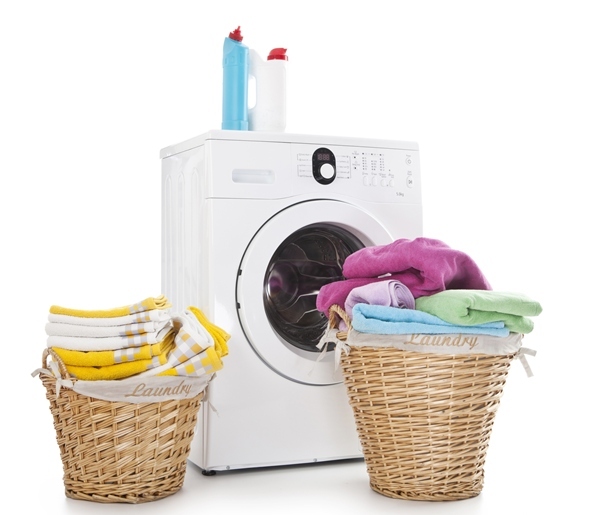 Lozanova, S., “Toxic Laundry Ingredients to Avoid,” Mother Earth News, April, 2012; http://www.motherearthliving.com/health-and-wellness/toxic-laundry-detergent-ingredients-zmez12mazmel.aspx, last accessed Dec. 12, 2013.